After a shaky start as Liverpool boss, I have stamped my managerial credentials on the Premier League as we are now hot on the heels of league leaders Arsenal. A top four finish should be a formality as we have gained a nice lead over Chelsea in fifth. We lost to Tottenham last episode but also picked up crucial wins over lower league opposition and welcomed back some key members of the squad. We have only three games in March which I am pleased about as it will allow key players, who have struggled for fitness, to regain some momentum ahead of the title run-in. We also have some very winnable fixtures which would see us keep the pressure on the Gunners. After a trip to Bournemouth, it’s that time of the year again where red meets blue in the Merseyside derby at Anfield followed by a home game against Watford. On with the episode and it’s off the south coast we go. For the first time in what seems like an eternity, we are back to full strength barring an injury to Joe Gomez which will rule him out of this month’s fixtures. I have faith in Mamadou Sakho to perform well in his absence as he has been chomping at the bit for some game time. Sadio Mane and Daniel Sturridge both return to action. First up is Bournemouth. We destroyed Eddie Howe’s men at Anfield back in November, and the Cherries haven’t improved since so this should be another routine win. Emre Can is suspended again, so Lucas Leiva gets the nod in the centre of the park. James Milner plays at left-back as Alberto Moreno has a knock. That was a close one. The lads showed great heart to come back and win this one. Jordon Ibe opened the scoring (of course he did), but Philippe Coutinho got us level with a superb goal. Sturridge put us ahead after rounding the keeper, but a mistake by Loris Karius gave Callum Wilson the equaliser. Just three minutes later, Sturridge bagged the winner with a powerful low shot from outside the box. Not the best of performances but three points is all that matters. On to the Derby. It has arrived! It’s derby day yet again. Last time out, we managed a 3-3 draw at Goodison Park, but I have faith in the lads to pick up a result at Anfield. After another goalkeeping error by Karius, I have decided to give Simon Mignolet a chance in goal. We welcome back Moreno and Emre Can to the starting eleven to face Ronald Koeman’s side. Merseyside is red! However, I can’t say I’m surprised. Another huge victory for the Reds! Sakho scored against Everton at Anfield for the second consecutive season from a Coutinho corner. The Toffees couldn’t handle Mane who doubled the scoring not long after. Kevin Mirallas got one back, but a rare goal from Nathaniel Clyne restored our lead. Phil Jagielka put the ball in his own net before Mane grabbed his second to seal the game. What a performance! 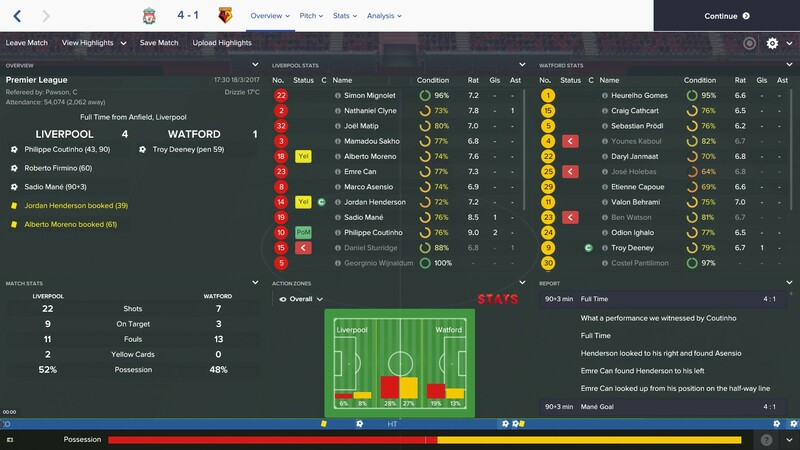 After our great result against Everton, we end this episode with a home game against Watford. We laboured to a draw last time we faced the Hornets, so we are out for revenge. Mignolet keeps his place between the sticks after a solid display, and I am giving Marco Asensio another run-out in the hope he finally lives up to his £25m price tag. Another perfect episode! Our attackers were just too much for Walter Mazzari’s men and a much improved second half performance ensured we ended episode eight with three wins from three. Coutinho bagged a free-kick just before half-time before Sakho fouled Troy Deeney in the box and the striker netted from 12 yards. Sturridge looked off the pace and his replacement, Roberto Firmino, put us back in the lead. Coutinho grabbed a brace in the dying stages and Mane continued his scoring form with a goal at the death. A quality performance that rounds off a marvellous month for us but another lacklustre performance from Asensio has alarm bells ringing. We have kept the pressure on Arsenal with three wins from three in March. We managed to overcome Bournemouth and gave Everton a beating at Anfield. While our first-half against Watford was poor, we responded and got the win after the interval. All of our attackers are in form and bringing Mignolet into the side has improved our defence. We must maintain our form to catch Arsene Wenger’s men who also enjoyed an unbeaten month. Asensio’s form is worrying, and I’m starting to think I’ve wasted my money. I want to give him a chance, but I can’t take risks with important games coming up. Next episode we have crucial games against Chelsea and Manchester United so stay tuned to find out our results! Thanks for reading! Nice series, keep it up!! That was a good read! 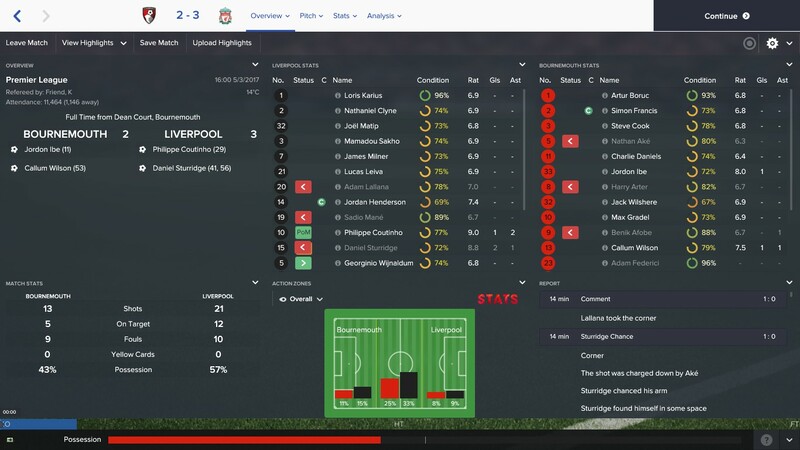 Are you a Liverpool fan, or just decided to give them a go on FM? Liverpool fan mate! Thought it was my turn to try and turn our fortunes around! The way your season is going IRL I can’t blame you haha! Good luck with the run in! The run in episode is live mate! Have a read!